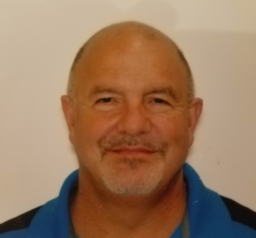 Looking for a custom deck builder? 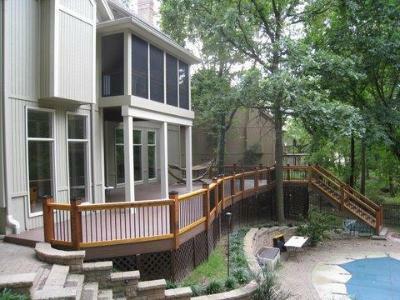 When you choose Archadeck, you are choosing an outdoor builder that has been building projects based out of Overland Park since 2001. We’ve built outdoor projects in every shape, size and in so many neighborhoods throughout this area. We build outdoor living spaces for how our customers want to live outside. 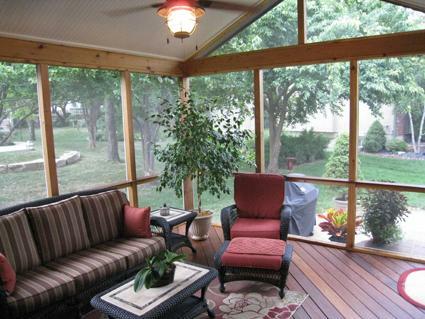 The AZEK deck and shed roof screened porch combination space you see in the image below was built to accommodate ease of traffic flow from the house, through the porch, onto the deck and out into the front or rear yard. Traffic flow is important. You want to maximize the outdoor living space and ensure you and your guests can easily move around to fully enjoy the space. Just as your home is unique, your Archadeck outdoor living space will be unique to your home. At your design consultation, we explore the activities you are looking to enjoy outside, the number of people that will regularly be enjoying the new space and even help you consider how your pets will use your new space. Your Archadeck outdoor living space is custom built just for you. How does your family want to live outside? Which months of the year does your family want to enjoy your deck? Adding an outdoor fireplace to your deck will allow you to enjoy your space a little bit longer each year. This deck and outdoor fireplace are covered with a beautiful pergola. 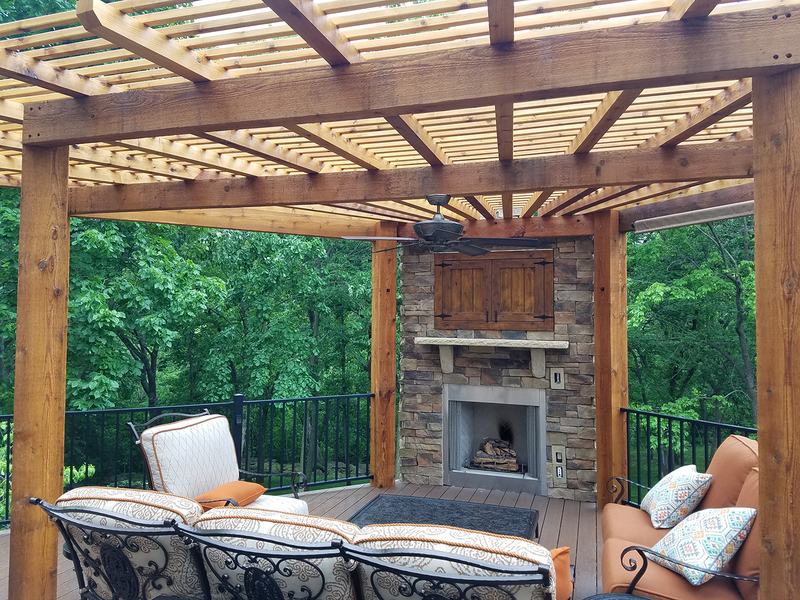 The pergola provides a little sun protection but adds tremendous ambiance to this stunning outdoor space in Lee’s Summitt. Do you have a steep grade in your backyard? If so, the main level of your home may be elevated off the ground in the back. 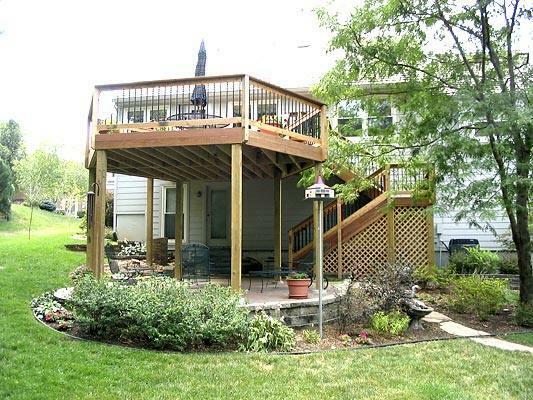 You will want your deck to be outside your living area and not outside the lower-level basement. 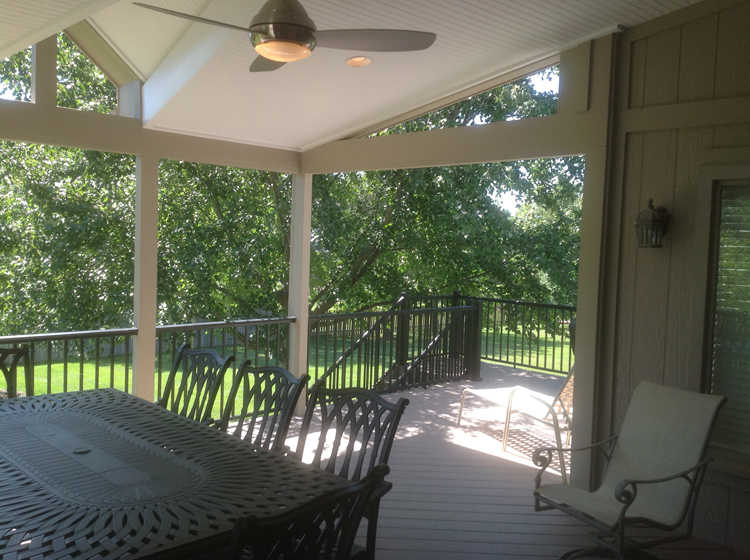 This elevated deck in Olathe KS creates a covered patio for the area down below. Notice the attractive lattice skirting under the stairs. Your home is unique. Your deck should be as unique as your home and should suit the way you want to live. This family wanted to be able to walk out to the deck from a couple different rooms. They also wanted easy access to their beautiful pool. From the deck, they wanted great visibility to the pool area. The slender-profile dark-colored pickets ensure maximum visibility out to the yard beyond. Are darker colors right for you? When you’re looking at sample blocks for colors selections, it’s difficult to imagine what those colors look like when used on a new deck or porch. 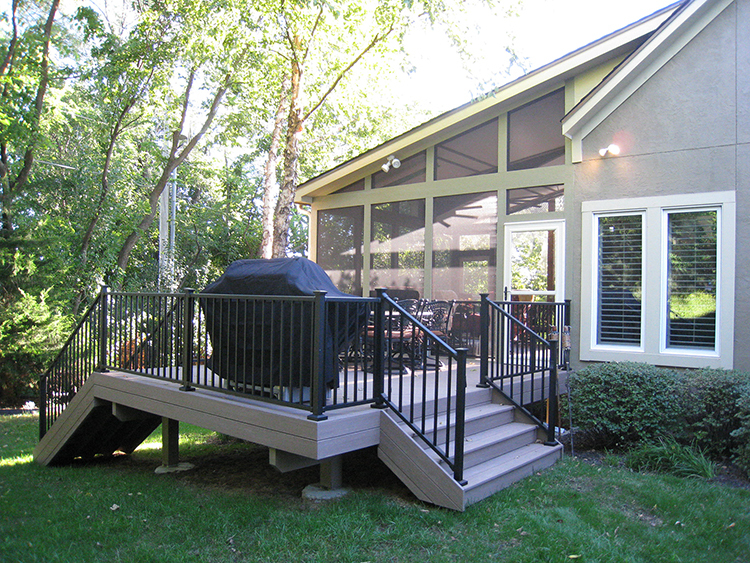 The deck below utilizes dark brown AZEK PVC decking with a black radiance rail. 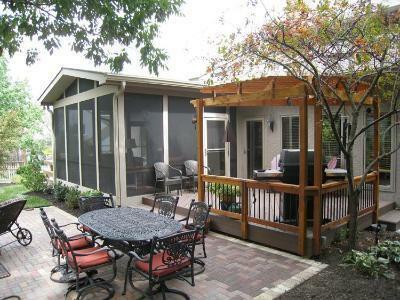 These dark colors work well in combination and add a look of sophistication to this Lee’s Summitt backyard. We urge all of our prospective clients to do their research. 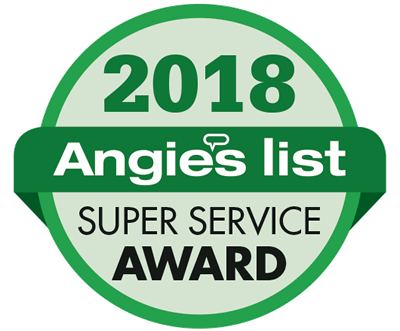 Check our reviews online on Angie’s List, the BBB and other review sites. 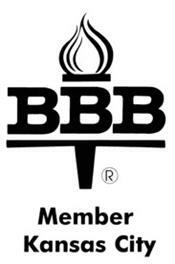 We are proud to maintain an A+ rating with the Better Business Bureau. Ipe (pronounced ee-pay) is a Brazilian hardwood that’s known for its strength, durability, and beauty. Because of how long it lasts and other performance factors, it can be considered the “other” low maintenance. Because it’s so dense, it’s virtually impervious to bugs eliminating bug damage. Water and sun are often the two biggest factors in aging wood. Ipe is so dense that very little water is absorbed so it does not have the regular expansion and contraction that other woods have. Ipe also has very little or no knots which are a weak point in wood. Its density also makes it less absorptive to mold, mildew and stains than other common softer deck woods. A distinguishing characteristic of this Brazilian hardwood is the color variation and beautiful streaking patterns of this exotic hardwood. Unlike low-maintenance materials, Ipe will require maintenance. Your Ipe deck must be sealed with an oil if you want to maintain the rich warm color. It does not need to be sealed but it will fade to a beautiful driftwood gray. 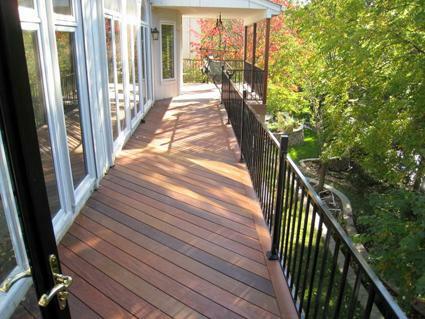 Depending on climate and location of your deck, the treatment process needs to be done every 1-2 years. It will vary with the amount of sun, rain, and other environmental factors and use. If you do let it go and you can’t bring it back with pressure-washing, you can bring it back by sanding. 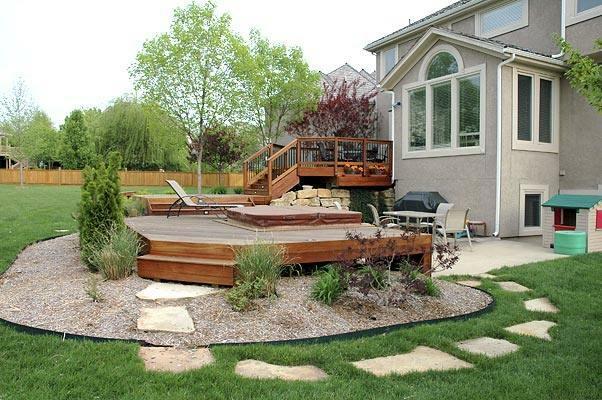 Multi-level Ipe deck with a hot tub. When we work with you to design the custom space for your home, we will ask you how you want to live outside. If you want to enjoy multiple different activities, you may want one area for eating, another for seating and possibly a third for other amenities. Are you looking for multiple outdoor living spaces?